George Sibley was born in Western Pennsylvania, but was conceived in Colorado, by Colorado natives, and thus considers himself to be a native Coloradan. 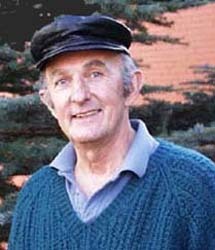 He returned to Colorado after graduating from the University of Pittsburgh in 1964, and has lived "mostly in the mountains" ever since. Most of that time has been spent in the Upper Gunnison River valley, west of the Continental Divide - first in Crested Butte, Colorado, where he ascended, more or less overnight, from ski bum to editor of the town newspaper, and more recently 30 miles downvalley in Gunnison where he worked for many years at Western State College of Colorado. He left the Crested Butte newspaper in 1971 for an envisioned career as a freelance writer, which became a career as "freelance oddjobber," with occasional writing jobs, for publications ranging from the local newspapers to Harper’s Magazine. One book was published in that period: Part of a Winter (Crown, 1977). For the rest of a living and life, he worked as a ski patrolman, bartender, construction worker, occasional contractor, sawmill operator, winter caretaker for a remote biological field station, forest-fire fighter, librarian, and other seasonal and part-time occupations. In 1988, he landed a position at the college in Gunnison, teaching halftime and developing a series of regional conferences at the college the rest of the time – exploring the issues of sustainability, community and "intelligent life on earth" that also infuse his writing. In 2007, he retired from the college to go back to freelancing and to participate more effectively in some community work. Click here for a listing of George Sibley's written work, with some links to work in online publications. Click here to email George Sibley.